Ashland was originally part of the Town of Holderness. The township of Holderness was granted by the royal governor to a group of proprietors in 1751. But because of the French and Indian Wars, the proprietors were unable to settle the township in the time required by the grant. So the township was regranted under the name of New Holderness in 1761. (The "New" was dropped from the name in 1816.) Factories spurred the growth of a village along the river. In 1849, the Boston, Concord and Montreal Railroad connected the village to national markets. Commerce flourished in the village, as stores were established to serve the mill workers. The village developed its own institutions. The interest of the industrial and commercial villagers diverged from those of the farmers in the rest of the town. 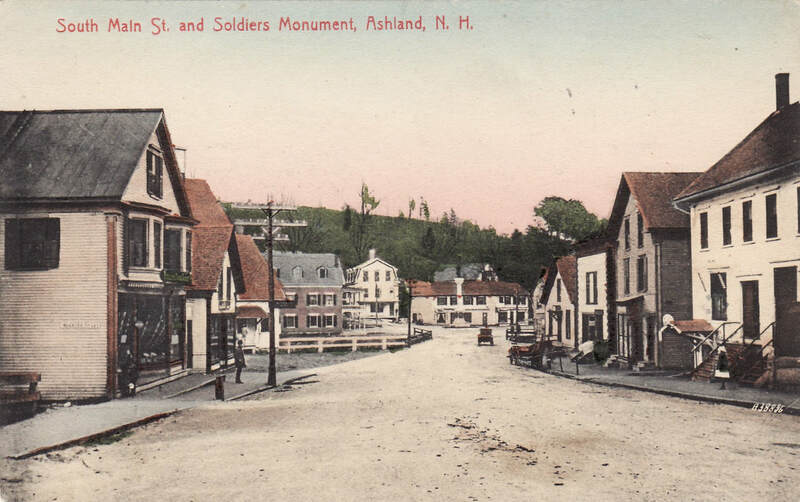 So, in 1868, the southwest corner of Holderness was incorporated as the new town of Ashland. Newspapers are available for use inside the library. Because of the fragile paper and bindings of the old newspapers, we are unable to put them in the copier. The Ashland Town Library has Heritage Quest Online available. Please inquire at the library for a user name and password. Records are kept at the Ashland Town Library for use inside the library. Contact the Genealogy Society for assistance.